People in wealthy, middle income, and developing nations have had very different economic experiences since the onset of the global financial crisis in 2008. Many rich countries have faced their greatest economic challenge in decades, while some emerging and developing countries have enjoyed continued growth that has lifted millions out of poverty. However, across all of these income categories there is a growing consensus that inequality poses a major threat to the global economy. A new study released today by the World Economic Forum highlights the extent to which global elites see inequality as a major challenge in the year ahead. Based on a survey of 1,592 leaders from academia, business, government, and the non-profit world, Outlook on the Global Agenda 2014 identifies the top ten trends facing the world in 2014. Number two on the list is widening income disparities (No. 1 is rising societal tensions in the Middle East and North Africa). Among respondents from Latin America, Sub-Saharan Africa, and Asia, income disparity is the top issue. Moreover, global elites do not believe inequality is receiving the attention it deserves. When asked how satisfied they are with the attention media and business are giving the top 10 issues on the global agenda, respondents to the survey are least satisfied with the amount of attention to the subject of inequality. Helene D. Gayle, President and CEO of CARE USA, an international humanitarian organization, spells out some of the key sources for growing inequality around the world: the lack of access to high quality primary and secondary education in many countries; public health problems, like chronic disease, that exacerbate income gaps; and social inequalities such as gender discrimination. In developing countries where a large percentage of the population is under age 30, a dearth of jobs could create social and political instability in the coming decade. Overall, global elites rate persistent structural unemployment as the third most significant trend for 2014. Elites and average citizens often disagree on economic issues, but on the topic of inequality there is broad agreement. One of the most striking findings from a recent Pew Research Center survey of general publics across the globe was the degree to which people see the gap between rich and poor as a major challenge. In 31 of 39 nations, half or more of those polled said inequality is a very big problem in their country. It is an especially important challenge in Africa. In all six African nations surveyed, at least 70% consider it a very big problem. Across these six countries, a median of 76% hold this view, higher than any other region. 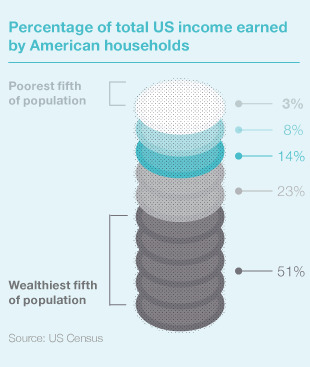 However, the rich-poor gap is a major concern in other regions as well, including wealthy nations. In places hit hard by the euro crisis, such as Greece, Italy, and Spain, overwhelming majorities rate it a very big problem. Publics around the world not only believe inequality is a serious problem – they are also convinced it is getting worse. In 35 of the 39 nations polled, at least half say the gap between rich and poor has increased in recent years. This view is especially common in Europe: 90% in Spain and 88% in both Italy and Greece say inequality is up. But even in Germany, which has weathered the financial storm far better than others in the region, 88% believe economic disparity has increased over the last five years. In many countries, the economic disruptions and unease of the past few years may be driving concerns about inequality, but the survey findings make clear that people do not see this as a short-term problem. Instead, they believe it is a central feature of their economic systems. When asked whether their country’s economic system is generally fair to most people or favors the wealthy, respondents overwhelmingly believe the latter. The only four countries surveyed in which less than half say their system favors the wealthy are Australia, Bolivia, Malaysia, and Venezuela. Whether it’s rich countries, poor countries, or the expanding global middle class, there is a widely shared view among both elites and ordinary citizens that inequality has gotten worse, and that it poses a major economic threat moving forward. Over time, our polling has found that people around the world generally support key features of economic globalization. Most believe trade is good for their country; and while support for the free market has declined in many nations, most still think people are better off in a capitalist system. However, it is increasingly clear that people around the globe believe those at the top of the economic ladder are enjoying a disproportionate share of the gains, while those below are being left behind.